Although some people think of calories as a dirty word, they're a part of everyday life. As you consume calories, your body converts them to energy to help you get through the day. Consuming as many calories as you burn keeps your weight constant, while burning a higher number of calories than you take in leads to weight loss. Conversely, a high calorie intake and low calorie burn lead to weight gain. Active people burn a significantly higher number of calories throughout the day than those with a sedentary lifestyle. 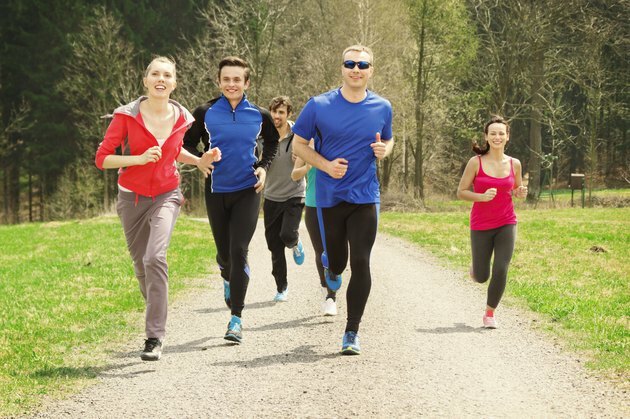 Although active people burn more calories than those who are inactive or less active, the average calorie needs of an active person vary according to age and gender, according to the USDA Center for Nutrition Policy and Promotion. An active woman between the ages of 19 and 30 burns about 2,400 calories per day, while an active woman between 31 and 51 burns about 2,200 calories. Active men in the two age groups burn about 3,000 and 2,800 to 3,000 calories, respectively. Sedentary people burn fewer calories throughout the day, which means they must consume lower-calorie diets to avoid weight gain. A sedentary woman between 19 and 30 years of age burns 1,800 to 2,000 calories daily, while a sedentary woman between 31 and 51 burns about 1,800 calories per day. Sedentary men in the two age categories burn between 2,400 and 2,600 calories and between 2,200 and 2,400 calories, respectively.